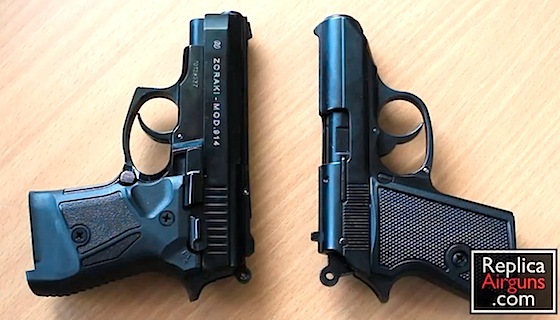 The construction of these Blank Guns is very different, the Zoraki Mod.914 is made with standards close to a real firearm and looks and feels very much like a real gun. The Kimar Lady K is not nearly as refined and lacks the fit and finish but still functions very well as a blank shooter. The Zoraki Mod.914 has a double stack magazine that holds a staggering 14 rounds but this does make the handle a bit on the thick side. The Kimar Lady K has a single stack magazine that only holds 6 rounds but this makes the handle much thinner and easier to tuck away. Both guns vent out of the barrel but only the Zoraki Mod.914 vents out of the front making it more realistic when shooting. The Kimar Lady K vents out of the top of the barrel which takes away from the realism and also makes the Blank Gun much louder to shoot as the sound tends to travel back towards the shooter. The Zoraki Mod.914 can shoot in semi auto and full auto modes while the Kimar Lady K is a semi auto only shooter. That said, I don't think I'll be shooting in full auto mode too often as blank ammunition is actually more expensive than regular 9mm ammo! If you live in Canada you really don't have too many option available, pretty much all I could find for blank shooters are the Zoraki Mod.914 and Mod.925 as both of these Blank Shooter are not considered replicas. In the US there are definitely way more options available if you're looking for a blank gun, the only downside to US blank guns is that they all have to vent from the top of the barrel.